Since 1986, Cape Cod Doormats has been manufacturing high quality Doormats of Distinction. Our doormats are handcrafted on Cape Cod by our own talented weavers, and have gained the reputation as the finest doormat on the market today. Cape Cod Doormats withstand the heaviest traffic, and trap dirt, mud, snow or sand before anyone walks through your door. Cape Cod Doormats are extremely durable, mildew and insect resistant, and unlike natural fibers, will not retain water or harbor insects. All of our doormats come with a manufacturer 5 year limited warranty, and many of our customers enjoy their doormats even longer. A Cape Cod Doormat is easy to maintain, just shake it or hose it clean with water. After many years of use, simply flip it over and it will look as good as new. Welcome to our page and thank you for visiting our website! Our Cape Cod Doormats are made to last and durable enough to withstand the harshest New England winters. Cape Cod Doormats come with a 5 year limited manufacturer’s warranty against defects that are due to faulty material or workmanship and sun damage that affects the integrity of the rope. This warranty does not include damage to the product resulting from accident, misuse or fading. 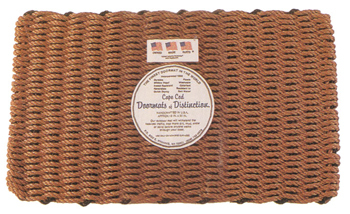 Our doormat rope is made by a manufacturer in New England specifically for our mats. It's a proprietary rope blend with UV protectant combined with the highest quality resin available. The UV protectant helps maintain the color year over year but it will not prevent fading. The more sun the doormat is exposed to will hasten the fading process. If you have an area that has direct sun all day long and are concerned with fading give us a call and we will find you a solution. Cape Cod Doormats are easy to clean - simply shake and rinse with a garden house a few times a year. Our mats are reversible and should be turned and rotated a few times a year to maintain its best appearance. If the product should become defective within the warranty period, we will replace it. Shipping and handling charges will apply and proof of purchase is required. We hope you love your Cape Cod Doormats for many years to come!